Now Through April 15th: Enter the FreedomShrine.com Scholarship Contest! 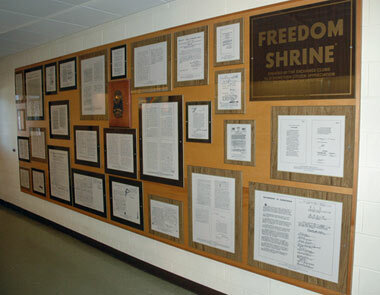 The Freedom Shrine is a Collection of 32 Historic United States Documents (1600's to 1900's). These documents serve as windows to America's proud past. 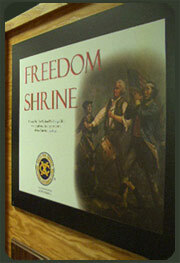 The Freedom Shrine originated from the Freedom Train. This train toured the nation in 1947 carrying an exhibit of famous "documents of liberty" such as the United States Constitution and Abraham Lincoln'sGettysburg Address. The tour was conceived to give Americans the opportunity to reflect on the meaning of American citizenship. The documents included were carefully chosen to exemplify the beginnings of our nation and the subsequent important United States turning points. Thousands of Freedom Shrines have been dedicated throughout the United States and Puerto Rico in universities, libraries, schools, state capitals, city halls and at American outposts scattered throughout the world. The documents have been reproduced and permanently laminated to individual plaques. They are used by teachers, students, and other groups to study American history. 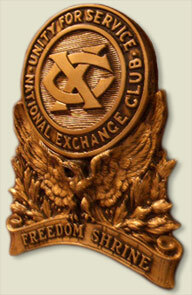 The Virtual Freedom Shrine on this web site is hosted by the Salem, NH Exchange Club. An Exchange Club is a group of people working together to make our communities better places to live through programs of service in Americanism, Community Service, and Youth Activities. Famous Quotes from the Freedom Shrine documents. Can you identify the QUOTES? See the famous faces of Americans from the virtual Freedom Shrine. Can you identify the FACES? (Pictured Above Left) Salem, NH Freedom Shrine at the Kelley Library. Photo courtesy of Hollie Hill Photography Derry, NH. Click To Enlarge Image. Kelley Library, 234 Main St., Salem, NH (603) 898-7064. Salem Town Hall, 33 Geremonty Dr., Salem, NH (603) 890-2110. Canobie Lake Park, North Policy St., Salem, NH (603) 893-3506. Salem Boys & Girls Club, 3Geremonty Drive, Salem, NH (603) 898-7709.